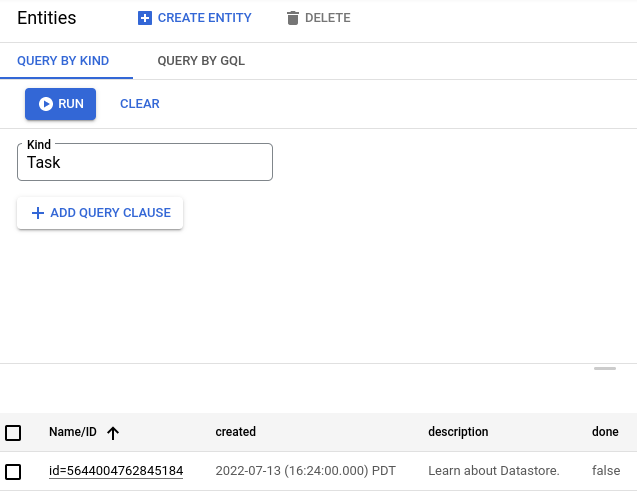 This page describes how to view and manage the entities, indexes, and statistics for the data your application stores in Google Cloud Datastore. It also shows how to enable or disable Cloud Datastore Admin access, and how to enable or disable Cloud Datastore writes. You can do these activities on the Cloud Datastore page in the Google Cloud Platform Console. Go to the Entities page to view the entities that your application stored in Cloud Datastore. You can also create, update, delete, and query entities on this page. Learn how at Cloud Datastore Quickstart. If you want to use bulk copy, bulk delete, backups, or restores, you need Admin access. Note: Previously, you could enable Datastore Admin through an App Engine app.yaml file, but this setting is now deprecated and will be removed from an upcoming SDK release. Warning: We no longer recommend using Datastore Admin for bulk deletes. Instead, we recommend using Cloud Dataflow to delete entities in bulk. It's normally a good idea to disable writes prior to a restore. This helps avoid conflicts between the restore and any new data written to Cloud Datastore. You can still use the Admin page to restore data and to perform bulk deletes when writes are disabled. Note: The Cloud Datastore API does not allow forcing writes when writes are disabled. However, App Engine client libraries allow forcing writes even if writes are disabled. So an application written with the App Engine client libraries could modify your Cloud Datastore instance while writes are disabled. Warning: The Datastore Admin backup feature is deprecated and will be shut down on February 28, 2019. It is replaced by managed export and import for Cloud Datastore. You should migrate to the managed export and import functionality at your earliest convenience. 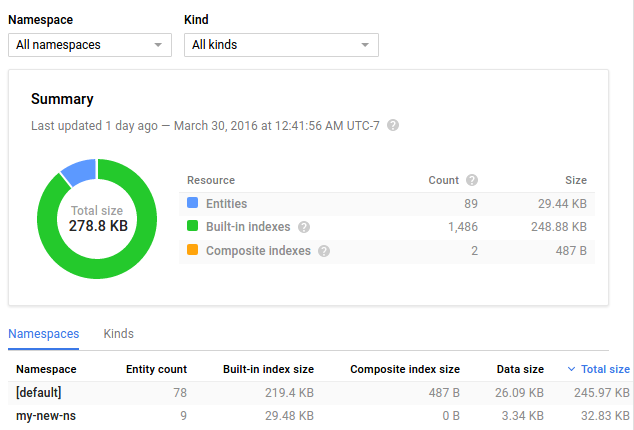 Get details about Cloud Datastore Statistics in the Console.